Do you suffer from Spring hayfever with sneezing, runny noses, itchy throats and sore eyes? If you do and want to try something more natural and holistic to support those symptoms, now is the time to try homeopathy to build up some resistance before the pollen counts increase. There are several over-the-counter homeopathic products to support the acute symptoms of hayfever. But if you want to treat these uncomfortable, seasonal ailments more deeply and build up your system to be less sensitive to allergens, it is much more effective to visit a homeopath. An appointment allows time for a personalised prescription to be worked out for you. 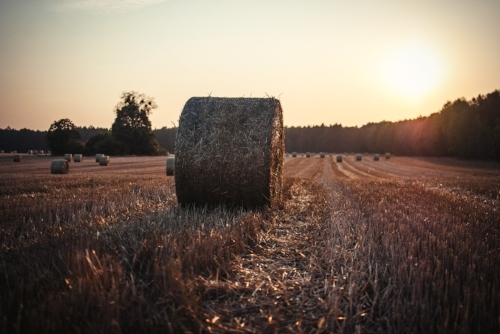 Your practitioner will look into your medical history, family history and find out what may have triggered your hay-fever. They will then choose the most appropriate and effective homeopathic remedy for you. HCHC Telford are running three clinics this March - pay us a visit and find out how you support your Hayfever and relieve those allergic symptoms naturally. HCHC TELFORD are offering mothers and babies joint appointments where babes under nine months can come in and be treated free. We will make a small charge for prescriptions. This offer is to support mums and their babies with symptoms connected to birth, breast-feeding, post-natal depression etc. - baby snuffles, colic, teething and sleep. We look forward to seeing your lovely babies! Many people struggle with their health at this time of year. Children and the elderly are particularly susceptible to symptoms like ear infections, colds and chest problems. People often resort to repeated doses of antibiotics and end the season can become quite run down. Colds and influenza tend to be more common in the winter months which often lead to lethargy with low energy and sometimes depression. Homeopathy is a wonderful way to look after yourself and your family during the winter months. A homeopath will match your symptoms with the symptoms of the best remedy for you as an individual. If you're a newcomer to homeopathy, it's worth getting hold of a simple book which explains how homeopathy works. New patients at the HCHC clinic get a copy of a little book called "Understanding Homeopathy" which simply explains how this system of medicine works. You can buy remedies over the counter but if you don't feel confident to self prescribe, our homeopaths at HCHC will be able to choose a suitable remedy for your individual symptoms. We do have free information sessions at our clinics as well as being able to offer low-cost treatment for adults and children. Please feel free to get in touch if you would like more information about your health and how we might be able to help you. Keep well this winter and pay us a visit. HCHC are delighted to be teaming up with Weleda right at the beginning of the festive season to bring you advice about keeping well with natural health-care and a bit of pampering using some of the beautiful, natural product range by Weleda. Weleda really understand the harmonious connection between nature and mankind. They have used this knowledge since 1921 by carefully selecting natural substances for their products in order to support the body’s own strengths. Their range of Arnica products including creams, lotions, sprays, oils to name a few really showcases this amazingly powerful plant which is often called the ‘Fall Herb’ and is widely used by sporting professionals. No first-aid cabinet should be without it! Our HCHC practitioners will be available to explain how to take Arnica as a remedy all the many uses it has. It’s our number one remedy for all injuries. This second half of the term can often be the most testing for children with increased colds, coughs and ‘flu. Homeopathic constitutional treatment helps build the immune system, making the body less susceptible to ill health. The beginning of an academic year may bring about a change of school for some children which can sometimes be a difficult transition - homeopathic remedies can help children adjust to the change and cope better. Homeopathy for children can be an important support in maintaining good health. It works with each child’s constitution, matching remedies to encourage better balance. Our TELFORD HCH clinic offers short FREE information sessions for you and your family to come in and discuss improving your health with us - how we work and how we might support you. IMMUNE BOOSTERS - a course of Echinacea and/or a good natural tonic (e.g. Floradix) are worth taking at the first signs of your child’s energy dropping and can help ward off any unwanted symptoms. We have Floradix KINDERVITAL FREE SAMPLES to give away at our clinic - please come in and help yourselves! TELFORD TEAM BEAT THE JULY HEAT! HCHC TeamTelford Homeopaths Anne Dingley and Rachael Sharpe stayed cool at Meeting Point House at our low-cost clinic on Friday! The good news is, we are planning to run the clinic twice a month now from September and then weekly once this second clinic fills up. Apart from offering affordable homeopathy we also have free ten minute sessions to explain how we might be able to help you or suggest natural products for you to support yourself to begin with. We look forward to meeting more of you and supporting the community. WELEDA WELLBEING FREE SAMPLES AT HCHC TELFORD! Please come in and take advantage of trying them out and finding out how Weleda products can help you and complement our work with natural healthcare and wellbeing at our clinic. SUFFERING FROM HAY FEVER SYMPTOMS? Itchy eyes, scratchy throats and runny noses are all the symptoms of common hay fever and is now on the increase at this time of year. There are some good natural products which you can buy over-the-counter but you can also be treated individually with a tailor-made homeopathic prescription to help ease these uncomfortable symptoms. We can support hay fever symptoms with various remedies and prefer to give treatment during the winter to build on the body's immune system to cope with HF symptoms in the Spring and Summer. So please feel free to drop into our clinic in Telford and we can talk you through how best to treat your symptoms - whether it's with a product you can source yourself or if you would like to be treated on a deeper level with one of our practitioners. We look forward to helping you. We are pleased to be back working at Meeting Point House and our first clinic was busy with a new team of practitioners who were keen to get started and support the community. So please spread the word as the busier we are, the more days we can open and be of service - not only with prescribing homeopathy but with giving natural wellbeing advice and suggestions for products to be able to buy over the counter - e.g. tonics and topical creams. We welcome everyone and particularly children with simple childhood ailments or perhaps parents would like to come in and chat to us about diseases such as asthma and eczema. Both of these common complaints can often respond very favourably to remedies. We always need to go into a fair bit of medical and family history to find out why symptoms start and the best route to re-balance the body to heal itself. Our next clinic is on Friday 25 May at Meeting Point House: 1 - 5 pm for appointments and free ten minute information sessions. It's advisable to book an appointment but well worth dropping in, as we have several practitioners who will be able to help you. We are pleased to announce that HCHC Telford is re-starting its low-cost community clinic this April - at the same venue MEETING POINT HOUSE in Telford city centre. We are running the clinic once a month to start with on a Friday afternoon. Appointments are preferable but this is also a drop-in clinic offering free general health and well-being advice where we can also explain how we work. 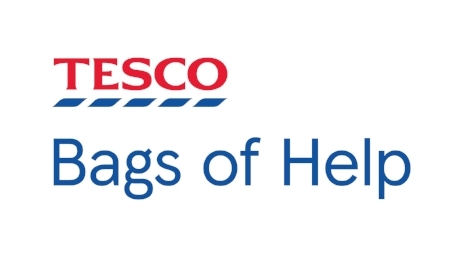 VOTING STARTED TESCO BAGS OF HELP FOR HCHC! 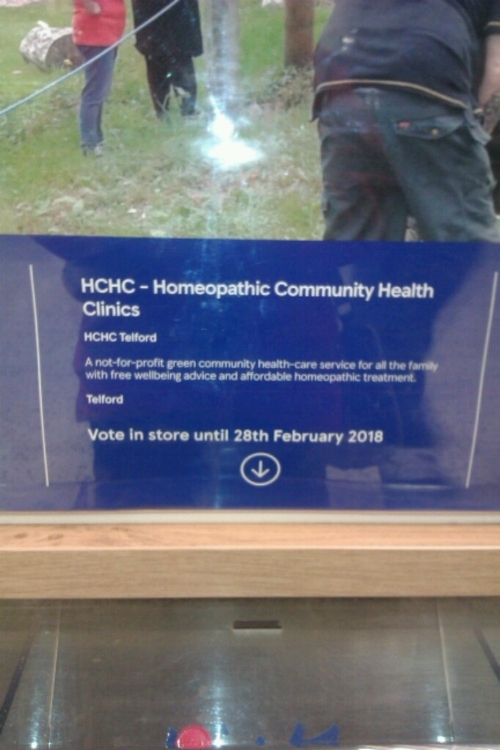 Please vote for HCHC - Homeopathic Community Health Clinics at one one the Tesco stores below! HCHC is a not-for-profit green community health-care service for all the family with free wellbeing advice and affordable homeopathic treatment. Exciting news! HCHC are through to the first round and have been shortlisted for a PUBLIC VOTE in Tesco's Bags of Help initiative! Please vote for us to win the top prize in store! 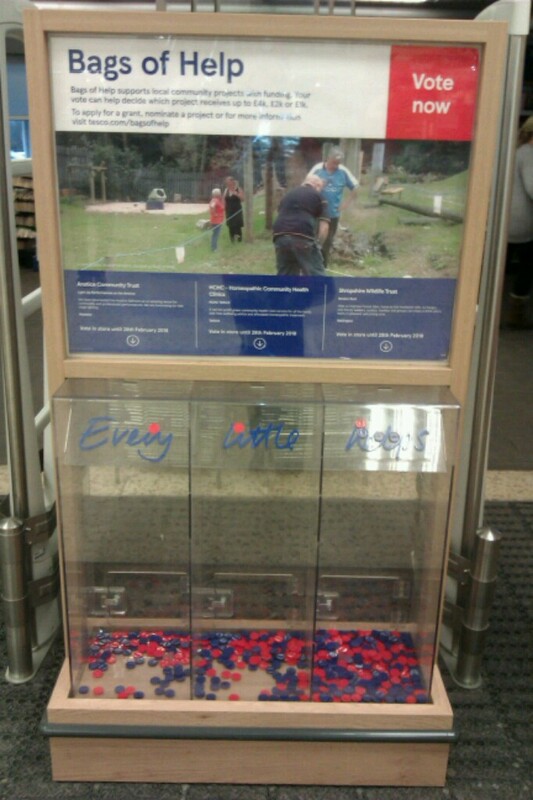 You can vote in any Telford Tesco store during January and February to help us secure a Tesco Bags of Help grant. We are planning the re-opening of our Telford HCH CLINIC right now so we can continue bringing low-cost homeopathy into the community. COLDS can be seen as a way of ridding us of unwanted toxins and nature's way of telling us to slow down. You can help this process by eating less and increasing your fluid intake with water, fruit and vegetable juices (organic if possible). This aids the de-tox process and conserves energy taken up by digesting food - or just eat fresh fruit and vegetables. Onions are considered as a natural diuretic, so a good home-made onion soup can be ideal. Colds and 'flu can also be supported with homeopathic remedies. Repeated coughs and colds are often a sign that there is something more chronic underlying and will need specific constitutional treatment from a homeopath to help improve natural immunity. So come along to one of our clinics and ask for advice or drop into a homeopathic pharmacy and they will be more than happy to suggest what natural remedies would be appropriate to support your condition. Health is about keeping in balance and that is what homeopathy aims to do - to help you back to wellness by re-balancing your body which in turn will stimulate its very own self-healing mechanism. Are you confused about how to treat an under or over active thyroid gland? A homeopathic practitioner will always look at your entire health picture and use a remedy or remedies to boost your general constitution to help stimulate your body's own healing powers. The link below is from the Homeopathic Medical Association website and it gives a good explanation about the thyroid gland and how it can be out of balance and how homeopathy can help to re-balance it. Worried about getting the 'flu? Now is the time to invest in a good immune booster such as Echinacea which comes in various forms, such as herbal tincture, tablets and pastilles. It's available at most good chemists including Holland & Barrett and Boots and really well worth taking a course of this powerful herbal favourite as a general support, especially if you are feeling a bit run down or if you've been in touch with someone who has the 'flu, even a cough or a cold. Homeopathy is also a way of helping to support the immune system and we call it constitutional treatment. This system of medicine is natural and non-toxic and can be a supportive way of helping to avoid those unwanted viruses. Homeopathy is used by many people all over the world as a form of preventative treatment and homeopathic remedies can also help support the actual symptoms which accompany the 'flu such as aching limbs, fever, headaches, lack of energy etc. Finding out about what you eat and drink is an important part of our homeopathic consultations. Not everyone likes the same food and our questions on what you take into your body could well find some keys to finding out why your health isn't as good as it could be. You may like to use salt a lot or have a particularly sweet tooth - you may dislike fat of any kind or eat lots of ice-cream. Some people prefer fizzy water to plain and won't touch certain foods e.g. oysters. They prefer cold to hot drinks - they may really like spicy food, eat loads of meat or are vegan by choice. 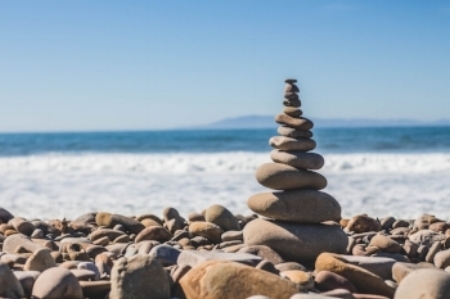 This information along with your family and medical history, together with information about what puts you emotionally out of balance helps us to create a more rounded view of you. You may be dealing with a past grief or major work stress, perhaps over-loaded with family life. We take all this information and choose the best prescription for you. Are you in balance? Could you be a busy mum or dad juggling lots and lots of tasks? Is the stress getting to you? Are you tired and irritable? Run down and not feeling yourself? If you are a busy mum, perhaps your hormones are causing an imbalance?